Can Cardboard Cutout Sales Predict the Next U. S. President? Advanced Graphics owner Steve Henderson started noticing the trend in the 90's and says cardboard cutout sales have accurately predicted the outcome of at least 6 different presidential elections. Since America began, consumers have been putting their money where their vote is by stocking up on candidate merchandise. 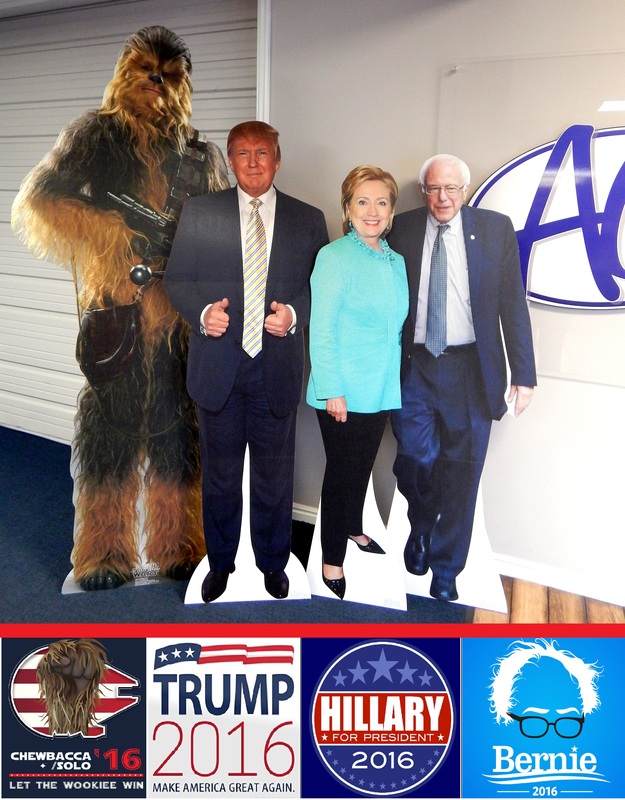 This year is no different as the republican and democratic Presidential Candidate's cutouts have risen to the top two spots on the Best Sellers list here at AG. Who is in the lead this year? Donald Trump. "He's been in the best seller for most of the year. He outsells Hillary 3-1." says company president Todd Henderson, "Because people are buying him whether they like him or not. I dunno, this could be the year that we're wrong. We'll see." With this election year bringing more drama than a reality TV show, all that's for sure is: love them or hate them people can't get enough of America's least favorite Presidential Candidates in history. Other retailers have noticed the trend too and say in past years their sales have had similar results. This year Spirit Halloween's annual "Mask Index" also shows Donald "Trumping" Hillary in sales. Will this years prediction come true? We'll all find out soon enough. Still looking for a cardboard cutout of your favorite candidate? We've got 'em. Click HERE to order!